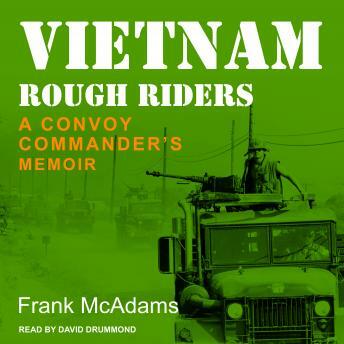 In the Vietnam War, American 'rough riders' drove trucks through hostile territory delivering supplies, equipment, ammunition, weapons, fuel, and reinforcements to troops fighting on the war's ever-shifting front lines. But, all too often, the convoys themselves became the front lines. Frank McAdams, a Marine Corps lieutenant, learned that the hard way during a tour of duty that began right after the 1968 Tet Offensive and the siege at Khe Sanh. In this compelling memoir he recounts his personal battles-not only with a dangerous enemy but also with an incompetent superior and a sometimes indifferent military bureaucracy. A decidedly different take on the Vietnam experience, his chronicle focuses on the ambush-prone truck convoys that snaked their way through dangerous terrain in narrow mountain passes and overgrown jungles. When an ambush occurred, strong leadership and quick thinking were required to protect both the convoy's mission and the lives of its men. Fast-paced and highly absorbing, his book offers an insightful look at a largely neglected aspect of the Vietnam War, while reminding us of how frequently the crucible of war reveals one's true character.